Banbridge has a new Irish Cup hero after Jonny Tuffey got his hands on the trophy on Saturday. Those hands were much to thank for the triumph as he kept a clean sheet with a flawless performance in Glenavon’s 2-0 win over Linfield. In truth, it wasn’t the goalkeeper’s most difficult day at the office. Linfield were outplayed by Tuffey’s team. He had only a couple of top drawer saves to make but it came as little surprise to the Glenavon support that he pulled those off perfectly. “It was absolutely fantastic,” he said after what was his first Irish Cup triumph. Tuffey’s Glenavon side were given a roaring send-off from Mourneview Park that morning, the road filled with fans along with blue and orange smoke. “To get to Mourneview Park that morning and see how many fans had turned up and get all the messages of support was great,” said the stopper. After Linfield bossed the opening exchanges, Tuffey stuck out a right leg to ensure Stephen Lowry’s effort didn’t find the net. And it was from that point on that Glenavon built a winning performance. “Linfield came out of the blocks very fast,” he conceded. “Thankfully I got my leg out quick enough to be able to make that save. It’s imoportant that I’m there to do my job when I’m needed. “We kicked on after that but we knew we had to be at our best or even a bit more to win the game. They can hurt you at the drop of a hat but our lads were on their A game and managed to minimalise their threat. Jonny and his Glenavon side were inspired to their winning display more than anything else by the memory of former striker Mark Farren, whose widow Terri-Louise led out the Lurgan side. “We watched a video of Mark’s goals before the game. It was special for Terri-Louise to be there to lead the teams out and it was an inspiration and a motivation for us all,” said Jonny. 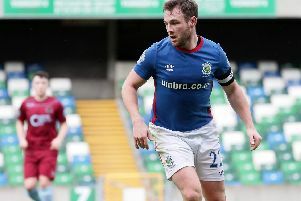 So what now for Jonny and his Glenavon side? Well, he wants to help make sure their steady rise up the Northern Irish football ranks continues. “We want to be challenging for trophies,” he said.